What really makes this game shine are all of the bonus features. 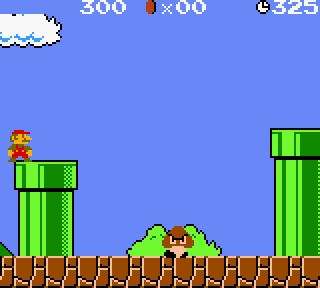 This version of SMB features an overworld map similar to Super Mario 3 and Super Mario World. On top of the normal game play mode that everyone is used to, the game features a “Challenge” mode in which you must find hidden objects in each level of the game. It also features the complete “Lost Levels” game (Super Mario Bros. 2 in Japan), referred to in this game as “Super Mario Bros. for Super Players.” The “Vs. Game” requires 2 Game Boy systems and a link cable, but allows you to play a 2-player simultaneous mode in which you compete in a series of 8 races through 8 SMB-style stages rife with obstacles meant to slow you down. The “You vs. Boo” mode is a single player version of the multiplayer race in which you compete against a computer-controlled Boo who cruises along overhead. The game also includes a few random items like a calendar, fortune teller, and photo album and is compatible with the Game Boy Printer, but these don’t add any value to the game and were probably aimed more at the Japanese market where they seems to appreciate minutiae of that nature. Buy Super Mario Bros. Deluxe on GameGavel or Amazon. Tagged 1999, Deluxe, Game Boy, Gameboy, Nintendo, Platformer, Review, Super Mario Bros.. Bookmark the permalink.